John Barrowman will be featuring as a guest on the show. This programme will be available to listen to worldwide after broadcast via the BBC iPlayer until 8th September (midday). The eighth in the series. Captain Jack faces a showdown with a man he thought long since dead. But while Rex takes extreme action, is it too late to prevent the collapse of society? This programme will be available to watch in the UK after broadcast via the BBC iPlayer until 23rd September. 'You see these eyes? They're old eyes. And one thing I can tell you... monsters are real!' The TARDIS takes the Doctor, Amy and Rory to the scariest place in the universe where the Time Lord must help a little boy called George and his desperate father. Confidential is on location with the Doctor Who crew, presenting behind-the-scenes action from a beautiful 17th century estate in the Gloucestershire countryside and a high-rise housing estate in Bristol. Matt, Karen and Arthur give us a bit of a sing-song, we spend a long night with the one of the assistant directors and the special effects team show us that, sometimes, good old-fashioned green gloop is the only way. Mark Gatiss talks to us about writing for three consecutive TV Doctors and, in Script to Screen, find out who plays an all-important historical figure. This programme will be available to watch in the UK after broadcast via the BBC iPlayer (SD/HD) until 8th October (8:30pm). Karen Gillan appeared on the show, chatting about the return of Doctor Who this weekend, and defending some criticism on how the show was getting too complicated to follow. This programme is available to watch in the UK via BBC News (28:50) until 2nd September. TV critic Kevin O'Sullivan discusses the return of Doctor Who with Matthew Wright. The series returns from its summer break. In the desperate search for Melody Pond, the TARDIS crash lands in Thirties Berlin, as the time-travelling drama returns for the second half of the series shown earlier in the year. The Doctor comes face to face with the greatest war criminal in the Universe. And Hitler. Old friendships are tested to their limits as the Doctor suffers the ultimate betrayal and learns a harsh lesson in the cruellest warfare of all. As precious time ebbs away, the Doctor must teach his adversaries that time travel has responsibilities. And he must succeed before an almighty price is paid. Confidential is back on set with Matt Smith and Karen Gillan in 1930s Berlin. We hang out backstage with the cast and crew and bring you all the behind-the-scenes action as the series gets back into full swing. We also bring you Script to Screen - the making of a mini Doctor episode written by schoolchildren and brought to life by Matt Smith and the Doctor Who team. This programme will be available to watch in the UK after broadcast via the BBC iPlayer (SD/HD) until 8th October (8:45pm). Tim Minchin presents the Comedy Prom, and ends the concert with the Doctor Who theme tune! This programme will be available to watch in the UK via the BBC iPlayer (SD/HD) (1:26:00) until 3rd September (10:40pm). Stand-in Colin Paterson, Boyd Hilton and Kevin O'Sullivan review the return of Doctor Who. This programme will be available to listen to worldwide via the BBC iPlayer (1:37:40) until 5th September (4:00pm). The complete series of Torchwood: Miracle Day shown to date can be viewed via the BBC iPlayer until 23rd September; see the BBC Torchwood programme page for episode links. A full list of episodes of Doctor Who and Torchwood being broadcast throughout the world is available from This Week in Doctor Who. This programme will be available to watch in the UK after broadcast via the BBC iPlayer until 3rd September. Arthur Darvill appeared as a guest on the show, chatting about Doctor Who and his other projects. The BBC Press Office have now released details on the second half of the 2011 series of Doctor Who, featuing interviews with Matt Smith and Karen Gillan. The wait is almost over. The second part of the thrilling new series of Doctor Who begins on 27 August 2011. The Doctor leads Amy and Rory across centuries and galaxies in a desperate search for baby Melody, but a terrible and inescapable date looms large. At 5.02pm on 22nd April 2011, the Doctor will die. These are his last days, and the quest for Melody his final mission. The search will result in a crash landing in Thirties Berlin and will bring them face to face with the greatest war criminal of all time. And Hitler. Old friendships will be tested to their limits as the Doctor suffers the ultimate betrayal and learns a harsh lesson in the cruellest warfare of all. A distress call from a terrified little boy will break through all barriers of time and space and lead the Doctor to visit the scariest place in the Universe. George's bedroom. George is terrorised by every fear you can possibly imagine. Fears that live in his bedroom cupboard. His parents are desperate – George needs a doctor. But allaying George's fears won't be easy. Because the monsters in George's cupboard are real. An unscheduled visit to a quarantine facility for victims of an alien plague – a plague that will kill the Doctor in a day – leaves Amy trapped. Alone, Rory must find Amy and bring her back to the TARDIS before the faceless doctors kill her with kindness. But Rory is about to encounter a very different side to his wife. In an impossible hotel, the Doctor, Amy and Rory find themselves checked-in but unable to check out. Walls move, corridors twist, rooms vanish and death lies in wait for every visitor. But the Doctor's time has yet to come. He has one last stop to make on his final journey. His old friend, Craig Owens, desperately needs his help – a new and unfamiliar presence is wreaking havoc in Colchester. And then come the Cybermen. But time catches up with us all and the Doctor can delay no more. By the shores of Lake Silencio, in Utah, all of time and space hang in the balance. And a NASA astronaut is waiting..."
With viewers still reeling from the shocking news that River Song is actually Amy and Rory's baby, Bafta-nominated actor, Matt Smith, provides a sneak-peek at what is coming up in the new episodes of Doctor Who. "I thought it was brilliant because it's such a great science fiction pay-off," explains Matt as he reveals how he felt when he learnt the truth about River Song. "Steven Moffat set it up so well and it now leaves the story open to go in so many different directions. She's Amy and Rory's daughter which is mad, but yet brilliant, and it's going to be really interesting to see how the dynamic between all of the characters shifts." Despite Melody Pond being kidnapped at the end of A Good Man Goes To War, Matt says viewers can rest assured that Alex Kingston, who plays River Song, will be back and there are more shocks in store. "We get to learn a lot more about River in Let's Kill Hitler" he explains, "and she's on her best flirty form; the River I love! It's certainly Alex's episode and we had great fun filming the scenes, so hopefully we have some good on-screen chemistry." New monsters are also set to make an appearance, sending children and adults alike scuttling behind the sofa in true Doctor Who style. "I think it's fantastic the way the show can tap into people's primal fears as children" says Matt, specifically referring to Mark Gatiss's episode Night Terrors. "Mark has come up with a really clever idea by featuring a dolls house with terrifying and creepy dolls – it's a brilliant adventure-packed episode and Danny Mays, who guest stars, is superb in it." The Tin Tin actor isn't the only high-calibre guest artist to secure a role in Doctor Who. Upcoming episodes also feature funny men David Walliams and James Corden. "James reprises his role as Craig, who appeared in The Lodger last year," explains Matt. "He's back in an episode which also features the Doctor's arch enemies, the Cybermen. We had such fun on set; it was hard to keep a straight face when we were filming. "David Walliams was also hilarious" continues Matt. "He plays a character called Gibbis and he had to wear a lot of prosthetics for the part. Once he was all made up he looked a lot like a giant Mole, so it was hard to take him seriously!" "The Doctor died at the start of the series" explains Matt. "He was shot in the future by someone in a space suit and, despite the adventures he goes on in these next few episodes, inevitably he's moving closer towards his own death. 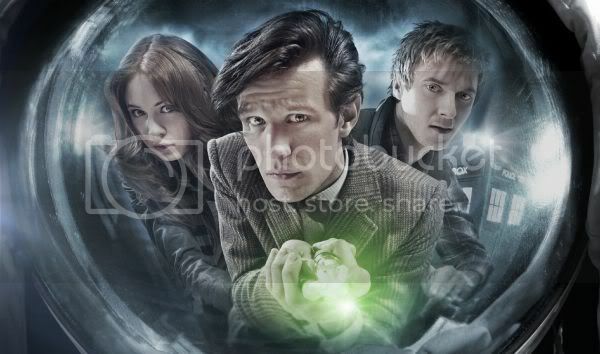 Amy, Rory and River are aware of his fate but they have no way of stopping it. I can't tell you what happens but Steven has set up an explosive finale." But can he reveal if his Stetson makes an appearance? "Yes, I can tell you the Stetson is back; I do love a good hat!" chuckles Matt. "The Doctor also has a new coat; a long green moleskin one. We always wanted the Doctor's outfit to evolve and the coat certainly kept me warm when filming during the winter. Recently married and now a new mum, a lot has happened in Amy Pond's world since she joined the Doctor in the TARDIS. However, there is no respite in sight for the feisty redhead as she undertakes a desperate search for Melody Pond and the Doctor's death edges ever closer. Actress Karen Gillan reveals what viewers have to look forward to. "I don't think she's willing to accept that's he's going to die," reveals Karen as she describes how Amy feels about the Doctor's impending death. "Amy has such a connection with the Doctor that goes right back to her childhood, so she's definitely not going to stand by and let him be killed without a fight. "She's also trying to come to terms with the fact that River Song is her daughter," continues Karen. "It's an interesting idea because Amy's maternal instincts are kicking in to play with a woman who is actually older than her! However, it's been brilliant exploring this new relationship dynamic with Alex Kingston who plays River Song. I also think the situation has pulled Amy and Rory closer together; they seem to have a stronger connection now." But along with this emotional drama, the new episodes also see Amy, Rory and the Doctor meet a number of weird, wonderful and scary monsters that will send shivers up the spines of even the most hardened Whovians. "The dolls in Night Terrors are extremely freaky!" squeals Karen. "They are really disturbing, especially when they were walking around on set! We've also got a monster called the Teselecta in Let's Kill Hitler which goes back in time to try and right the wrongs of the past." Karen also had an interesting experience filming with comedy actor David Walliams. "I've only ever met David when he's been dressed as a mole," reveals Karen, describing David's character Gibbis. "He was always on set an hour before me because he had to have prosthetics put on and to this day I've never met David looking like David! He was an absolute hoot though," continues Karen. "He was extremely witty and, to be honest, I'm a bit nervous about meeting him when he's not in his mole get up!" But David isn't the only Doctor Who actor to receive a makeover in the upcoming episodes, Karen also found herself sat in the make-up prosthetics chair. "In The Girl Who Waited I had to spend hours in make-up because I play an older version of Amy. I can't give too much away but it was great fun – despite the early starts each day! I also got to film an amazing fight sequence for the episode," reveals Karen. "I had two weapons and had to take on six Handbots. I worked with a stunt co-ordinator who choreographed the scene and I had to do it in one fluid movement. It was actually quite difficult and I take my hat off to people who do that for a living."